You are having a good morning. It’s cloudless outside and you had a delicious cup of Joe. You are off to open your business for another new day and new customers. You park easily near your shop and walk to the front door of your business. Pulling your keys out of your pocket, eyeing the key to the door when you realize that the tip of your key has chipped completely off! You knew you should have got that spare key made by an expert locksmith in Spokane, but it never seemed like there was enough time. Now you are locked out of your business with no alternate way to get inside. Luckily, there are professionals who have been trained with a lot of experience who can assist you in getting out of this situation. 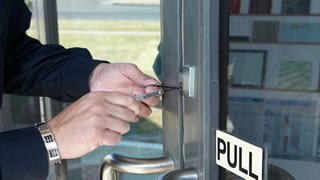 Call upon a commercial locksmith to drive to your location and get you quickly inside your business. While they’re there, they can have a lock rekey done as well as providing you with a brand new working key. All of this can be done for you on the spot! You may have noticed that I mentioned that the Spokane locksmith will perform a rekey. This is only necessary when there is no existing key for the locksmith to copy. Although it is possible to impression a new key from the existing locking cylinder, it is very time consuming and requires a lot of accuracy. Having your lock rekeyed instead is a cheap option that will also increase the security of your property. There is no chance anyone has the key to your property and you know for certain that your lock is going to be in working condition for much longer. If you don’t want to have your lock rekeyed, it is important that you choose to keep a spare somewhere in your possession. Remember, whenever you find that you are having any troubles with the locks of any property that you can give your local locksmith in Spokane a call with your concerns. If it is important to you that you keep your business and belongings secured, a locksmith will easily be able to help you achieve that. A business utilizes stronger locks than residences, let a locksmith explain the difference to you and you may find that you want higher grade lock installation at your business property.